RIP Admission for 1 (one) guest to the "Heaven & Hell" Madd Hatter Halloween event on Saturday October 26. Must enter the venue by midnight with your admission ticket. The newest addition to the Hoboken nightlife scene is quickly taking Washington Street by storm. If you've been to Hoboken recently and overlooked Madd Hatter, you're truly missing what Hoboken has become. A vibrant community with fun and outgoing party goers looking for a great selection of draft beers and music. With forty TV's to choose from, Madd Hatter has it all. Which is why this Halloween is the perfect time to see what they're all about. Have plans for HalloWeekend? Well, now ya do! 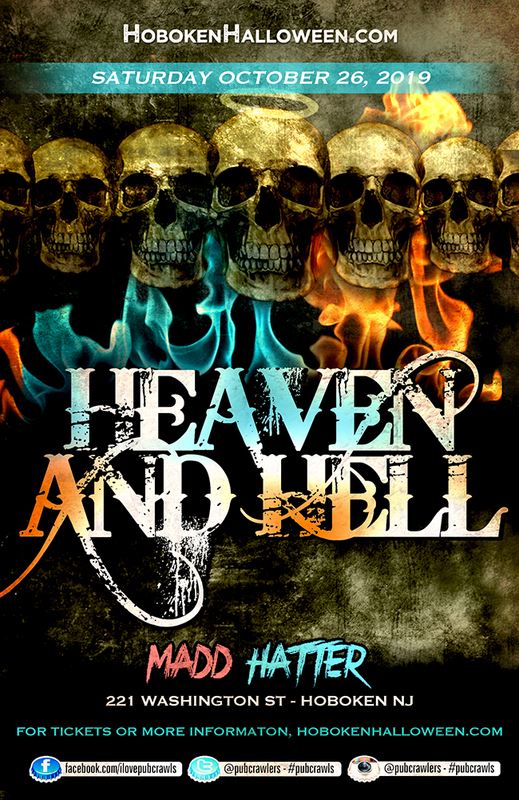 "Heaven and Hell" is coming to Madd Hatter. There are plenty of Halloween party options to choose from in Hoboken but don't you want to explore the newest venue in town? A party holiday such as Halloween calls for the spookiest, sexiest, and wild costumes to come out from the grave and into the streets. Join us at Madd Hatter this Halloween and see what all the buzz is about.